Striving for excellence in customer service is to gain the competitive advantage. It is the keystone for the business to grow and prosper in the right direction so that it builds through repetitive sales to existing customers and referrals to potential customers. 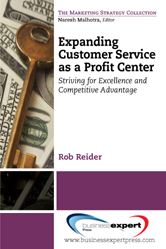 If you were to look at customer service in your organization as a major business component and all customers are treated with excellence prior to the sale, during the sale, and after the sale, customer service will become a profit center that builds sales dollars to the top line and real profits to the bottom line. This book can help you and any organization manager achieve customer service excellence with its basic principle of doing the right thing at the right time for the right customers. It can also assist in building organizations with strong customer bases and sales loyalty. The author smartly gives you real practical âhow tosâ in providing excellent customer service in all aspects of your operations by doing the right thing despite the counter pressure within your organization. As many businesses are struggling to be competitive, or merely to survive, this book is your primer or âhow toâ for identifying and maintaining customer service excellence in all operational areas on the path to developing a learning organization. No matter what type of businessâthis book can be a learning, coaching, and mentoring tool in your quest to make the delivery of customer service the best possible in todayâs ever changing business environment.